Many Wii users find that they cannot open or play AVI files on Wii even if Wii claims supporting AVI format. How does it happen? Is it a dream to play AVI on Wii without limitation? The following article will solve these puzzles for you. Why Fail to Import AVI to Wii or Play AVI Files on Wii Sometimes? In fact, as a Nintendo home video game console, Wii does work with AVI format. However, Wii requires AVI with Motion JPEG codec. In other words, if your AVI files are not with Motion JPEG codec, Wii will fail to play them. Therefore, it is not a dream to play AVI on Wii freely as long as we convert normal AVI files to AVI with Motion JPEG codec. In addition, Wii also support MOV with Motion JPEG codec. 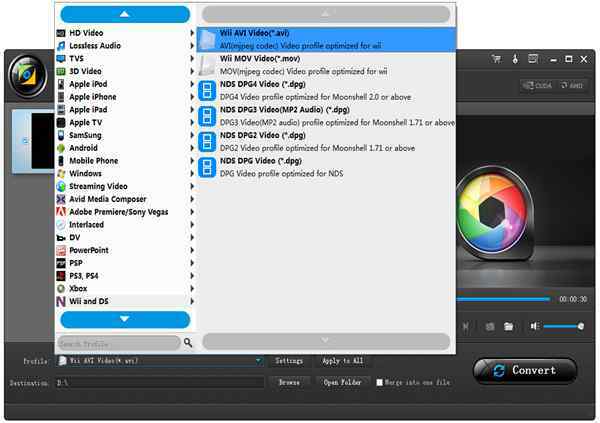 Therefore, to play AVI videos on Wii without trouble, you can choose to convert Wii unsupported AVI files to AVI with Motion JPEG codec or MOV with Motion JPEG codec. In order to provide more convenience for you, the following passage will show you a detailed guide on how to convert AVI to Wii with a professional AVI to Wii Converter to play any AVI files on Wii as your own wish. This ideal AVI to Wii Converter offers the best way to play any AVI on Wii. You can convert Wii unknown AVI, HD AVI, 2D AVI or 3D AVI to AIV Motion JPEG codec or MOV with Motion JPEG for Wii/Wii U. Besides, this AVI Wii Converter optimize to convert other video audio formats to Wii like convert MP4, WMV, FLV, MKV, MOV, VOB, MP3 to Wii, convert MXF, WebM, WTV, ASF, Xvid, FLAC, WAV etc. to Wii/Wii U. In addition, Wii AVI Converter enable convert among hundreds video audio formats with no quality loss like convert IFV videos, convert ISMV videos, convert YouTube to Windows Media Player etc. You may need to do some video editing before converting. 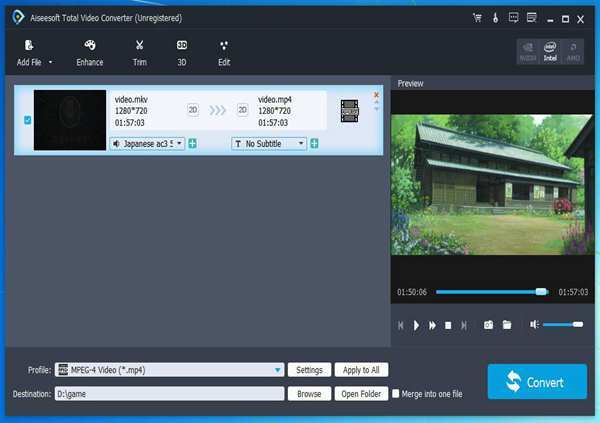 AVI to Wii Converter can merge videos together, cut videos, rotate videos, adjust watermark, add 3D effects, change parameters like adjust video channel, video and audio bitrate and resolution and more. Free download AVI to Wii Converter (For Windows, For Mac) to your computer. Launch it. Simply drag and drop files to AVI Wii Converter. You can also click “Add File” button to load AVI files to the software. Click “Profile” drop-down button to choose your desired format. To set AVI as the output format, choose “Wii AIV Video (*.avi)” from “Wii and DS” category. To set MOV as the output format, choose “Wii MOV Video (*.mov)” from “Wii and DS” category. To convert files to other formats, just set the wished format there. Click “Convert” button to start converting AVI videos to Wii. When the conversion is completed, click “Open Folder” button to get the converted files and transfer them to Wii or Wii U for enjoying. Click “Clip” “3D” “Edit” “Video Enhance” “Crop” “Effect” “Watermark” “Audio” “Setting …” tabs to optimize files as your wish. It is so easy to convert AVI to Wii with AVI to Wii Converter. Why not free download it and start play your AVI on Wii right now? How to Rotate AVI Files/Videos with AVI Rotator Successfully? This entry was posted in How-To and tagged avi to wii, avi to wii converter, avi wii, convert avi to wii, how to play avi on wii, play avi on wii, wii avi. Bookmark the permalink. ← How to Convert MP4 to DPG with MP4 to DPG Converter on PC/Mac?